A lot of the things we did and didn’t do when we were kids would be considered negligent by today’s standards, but they gave us a freedom that children just don’t experience nowadays. First of all, I have to say that my mother really had no idea where we were for a better portion of the day once we were school age. She had a large bell that she would ring to call us home for dinner. This, of course, was incredibly embarrassing and we were teased mercilessly. One of the highlights of the day was riding our bikes to the corner store for candy with money we had earned from collecting pop bottles. It was common to be required to buy your parents cigarettes as well, and then you were given a note saying that the kids presented to the shop owners and you were then allowed to purchase cigarettes ostensibly for your parents. Oftentimes we were allowed to keep the change (this was our delivery fee) and therefore it added to our candy budget. Before we spoke about candy bars and lick m aid but I would like to add to the list. You might remember Pop Rocks which had some secret ingredient (citric acid?) that made them pop and fizz in our mouths. And the penny candy Mojos. As some might remember they were a chewy fruit (not all that soft) flavoured confectionery that would make parents today have a heart attack if their kids were eating them. We can’t forget jaw breakers. I know these had been around a long time before I was a child, but what is the point of them? Is it a conspiracy to drum up business for big dental? Honorable mention should go to grab bags. I used to get quite excited about them. I think even back then logically we knew it was the left over candy that nobody wanted, but somehow there was a great anticipation in not knowing what was in there. This led to much disappointment and feverish trading between us all jockeying for the more coveted candy. (probably due to lack of funds – when are we going to make this part of national medical?) and by the time I went to the dentist the first time when I was 10 I had at least 6 cavities. One day when I was riding my bike on Lancaster Crescent down by the tennis courts and I spotted a $2 bill on the ground. Rather than pick it up I rode the 2 blocks back to our house and told my mom. I did and it was and for some reason, this sticks in my head. I must have been riding my banana seat bike as this is the first one I remember having. I vaguely remember my father teaching me to ride, running down the road. Though that could’ve been my brother as he was close to the same age as was probably taught to ride about the same time. A clearer incident involved my first solo ride. We were in the park across Airport Road near to my best friend at the time,V H’s house. I must’ve gone a whole 20 feet before I tipped over sideways and somehow managed to knock a big healing scab off my knee with the handle bar which was missing its original grip. Miraculously the raw handle bar connected with the scab on my knee and gush, out came the blood! V carefully escorted me to her house, both of screaming our heads off and her mother rinsed my knee in the bathtub and gave me a bandaid. I was none worse for wear. Successful maiden solo mission complete! I later wrote a song about this and it was in my second album ‘Unlimited Growth’. If you’re curious, you can check that out here. Scroll down to ‘Andy’s Song’. V’s mom was one of the Peanuts adults. You know ‘wah wah wah.’ I’m not sure why I remember some parents more than others. It might be a good thing. If you think about it, this might just mean that V’s mom was a competent adult and so therefore doesn’t stand out much in my mind as there were way more crazy ones around to compare her too. Next door to V lived a single Spanish man who gave me my first nickname. 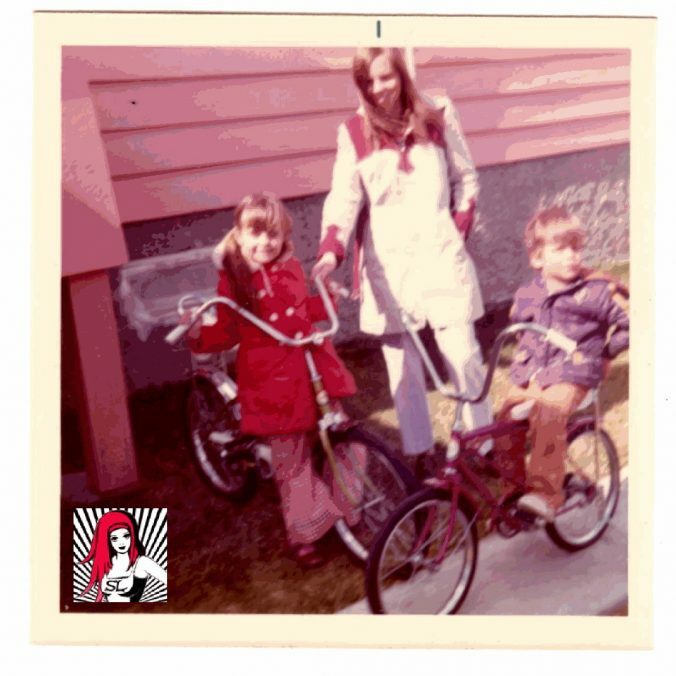 At the time, I was called by my first name Lori or Lori-ann and he used to call me Laura Secord, which the neighborhood kids shortened to Secord and then to Cee. That stuck for quite a while, at least all the way through elementary school at least until Sea Island Elementary was closed and we had to bus to Brighouse Elementary on Azure Lane off Gilbert Rd. in Richmond proper. Single men living alone who talked to children were not automatically considered suspect back then. It was free reign for us kids as we ran from yard to yard. We owned that block.